ABSTRACT:Foraminiferal assemblages from four stratigraphic sections of the Trieste-Pazin basin in central Istria,Croatia (southwestern Tethyan realm) were investigated to reconstruct paleoenvironmental conditions and to determine the age of these deposits. 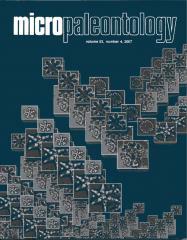 The following five Middle Eocene planktonic foraminiferal zones were identified from the range and frequency of foraminiferal species: Globigerinatheka kugleri/Morozovella aragonensis Zone (E9), Acarinina topilensis Zone (E10), Morozovelloides lehneri Zone (E11), Orbulinoides beckmanni Zone (E12), and Morozovelloides crassatus Zone (E13). A data set of benthic foraminifera relative frequency has been subjected to R- and Q-mode cluster analyses to demonstrate the linkage between taxa distribution and paleoenvironmental gradients. Benthic foraminiferal biofacies indicate that the environment evolved from an initially mesotrophic upper bathyal slope setting towards a deeper,more oligotrophic, middle bathyal setting influenced by turbidity currents. The oligotrophy was a result of the deepening processes, and a consequential decrease in organic flux. The documented short-term periods of eutrophic to mesotrophic conditions within the deeper oligotrophic regime might represent a paleoceanographic influence of water-masses from an adjacent basin to the northwest, thus recording its paleogeographic connection with the Trieste-Pazin basin during the Middle Eocene (Lutetian).